The Frozen shoulder develops when one stops using the shoulder joint due to pain, a long-term health condition or an injury. 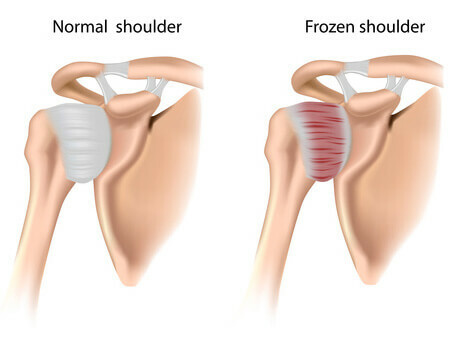 Here, the shoulder joint becomes stiff and is incapable of its expected range of motion and can be easily described as ‘frozen’. A frozen shoulder could also result from diabetes or a stroke. The diagnosis is made by doctors after a physical exam which aims to gauge the range of movement of the joint. X-rays are also used in conjunction with the physical exam to see if the conditions are brought on by a broken bone or arthritis. The frozen shoulder occurs mostly after an injury and is most prevalent in the age group 40-70. The treatment usually starts off with the administration of anti-inflammatory drugs that are non-steroidal in nature. Mild heat is applied to the area and the joint is gently stretched out as well. Ice is used to bring down the swelling and corticosteroid injections are used to reduce the pain. A frozen shoulder could possibly take up to a year to completely heal and if the treatment isn’t helping, surgery is resolved to. There are 2 kinds of surgeries that are performed to relieve on of frozen shoulder. The first kind is called ‘manipulation under anesthesia’ where the patient is anesthetized and the arm is moved into positions that would stretch out the tight tissues. The second kind of surgery makes use of an Arthroscope to cut through the tissues. Gentle exercises that involve stretching and the usage of the shoulder joint after an injury or surgery goes a long way in its prevention. Even experts still don’t know the reason behind some of the cases reported. In the case of a frozen shoulder, it is most important to follow your doctor’s instructions down to every last detail. Usually, a frozen shoulder always gets better over time. If you would like to know more about the frozen shoulder or any other shoulder injuries, please do feel free to get in touch with us.